The following is a list of Reaching Critical Will publications. They are available for download in PDF or in hard copy upon request. This updated study explores the ongoing and planned nuclear weapon modernisation programmes in China, France, India, Israel, Pakistan, Russian Federation, the United Kingdom, and the United States. Published in advance of the 2019 Non-Proliferation Treaty Preparatory Committee, this briefing book provides an overview of the current state of play and the critical issues ahead for this review cycle. Reaching Critical Will is pleased to have published a new resource guide for the WILPF network about autonomous weapon systems, also known as killer robots. Reaching Critical Will is pleased to have published a new resource guide for the WILPF network about the Treaty on the Prohibition of Nuclear Weapons. Published in advance of the 2018 Non-Proliferation Treaty Preparatory Committee, this briefing book provides an overview of the current state of play and the critical issues ahead for this review cycle. Published ahead of the 2017 UN General Assembly First Committee, this briefing book highlights a number of critical disarmament topics and suggests how governments can achieve progress. Published in advance of the 2017 Non-Proliferation Treaty Preparatory Committee, this briefing book provides an overview of the current state of play and the critical issues ahead for this review cycle. This shadow report, prepared with the WILPF human rights programme and the European Center for Constitutional and Human Rights, looks at Germany's extraterritorial obligations under the Convention for the Elimination of Discrimination against Women (CEDAW) related to arms transfers and their impacts on women. Published ahead of the 2016 UN General Assembly First Committee, this briefing book highlights a number of critical disarmament topics and suggests how governments can achieve progress. Together with WILPF's Human Rights programme, Reaching Critical Will prepared three briefs to the Committee on Economic, Social, and Cultural Rights on the transfer of weapons from France, Sweden, and the United Kingdom to Saudi Arabia and the use of explosive weapons in populated areas in Yemen. This publication considers synergies—and contradictions—related to gender and women in a number of multilateral resolutions, treaties, and commitments on conventional weapons and women's rights and participation. In advance of the 2015 NPT Review Conference, Reaching Critical Will has produced a briefing book that highlights a few critical issues that states must take into consideration during the Conference and beyond. At the 2010 NPT Review Conference, states parties adopted a 64 point action plan in order to further the implementation of the treaty. Reaching Critical Will, in partnership with the Government of Switzerland, has produced comprehensive reports on the implementation of this action plan from 2011 to 2015. Published ahead of the 2014 UN General Assembly First Committee, this briefing book highlights a number of current disarmament issues and suggests ways forward. Concern with the use of explosive weapons in populated areas has increased over the last few years, due to the severe harm caused to civilians and the wider community. However, the debate has so far not sufficiently highlighted the specific impact that explosive weapons have on women. 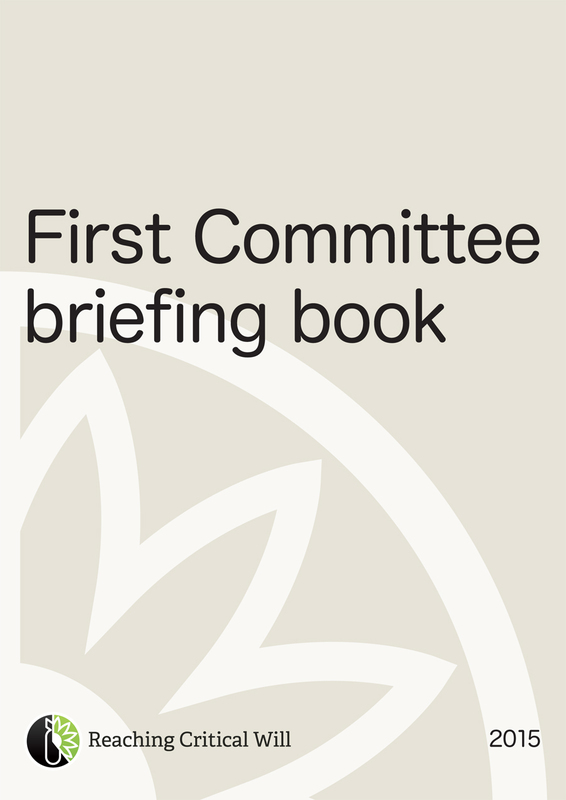 Published ahead of the 2013 UN General Assembly First Committee, this briefing book highlights a number of current disarmament issues and suggests ways forward. One year after the release of the groundbreaking 2012 report Assuring destruction forever: nuclear weapon modernization around the world, nuclear-armed states have continued to invest in modernization of their nuclear systems. Today, more than 16 years after the Comprehensive Nuclear Test Ban Treaty (CTBT) was adopted, significant obstacles remain on the path to its entry into force. This report on government positions on the CTBT highlights why entry into force of the treaty should not be treated as a precondition to nuclear disarmament or to the commencement of negotiations on a treaty banning nuclear weapons completely. On 11 September 2011, six months after the disaster at the Fukushima Dai-ichi Nuclear Power Station in Japan, Reaching Critical Will released an NGO world-wide study on the implications of the catastrophe. Beyond arms control is a collaborative work of non-governmental researchers and activists who critically examine the mainstream discourse of nuclear weapons. A civil society analysis of the current disarmament regime and response to the WMD Commission Report, released in May 2007 by the Lawyers' Committee on Nuclear Policy, Western States Legal Foundation, and Reaching Critical Will of WILPF. The Model Nuclear Inventory is a comprehensive database of all nuclear materials, both military and civilian, in the 44 States recognized as having a significant nuclear capability. Because the Inventory is designed to encourage better reporting in the context of the nuclear Non-Proliferation Treaty (NPT), only NPT states parties are included. The Model Nuclear Inventory is a comprehensive database of all nuclear materials, both military and civilian, in the 44 States recognized as having a significant nuclear capability.